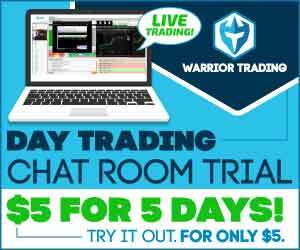 Warrior Trading operates one of the largest day trading chat rooms for day traders and swing traders. We offer live trade alerts and stock market education in our day trading chatroom Monday-Friday 9am-4pm. We provide our daily watch list free for members and guests. Check out some of my Recent Winners off the watch list here. On the watch lists below you won’t see the typical penny stock trade ideas of other sites. We typically focus on trading stocks priced above $2 and below $10, although you may see high priced names like $TSLA and $NFLX side by side with lower priced stocks. Remember that we are not investors and these are not long term investments in the stock market. We trade the stock market looking for quick opportunities to lock in 5-10% winners. Small caps and penny stocks offer the best opportunities for those moves. Most mornings the stocks on this watch list are already gapping up (opening higher than they closed yesterday). This is indicative of a catalyst such as earnings, press releases, etc. Sometimes these gaps are purely technical without news behind them. Regardless of the catalyst, I’ll be watching these for Gap and Go Strategy opportunities. When stocks are gapping up they often have the potential to squeeze 20-30%. If I can capture even 1/3 of that move, I can do really well. My job is first to identify stocks with home run potential, and then second to find an exact entry. I call out all my entries and exits in that chat room for our students. As part of my Momentum Trading Strategy and Gap and Go Strategy, I want to enter these small caps and penny stocks as quickly as possible. If they open and start selling off immediately, I may watch for a red to green move. That means I’ll look for 2-3 red 1min or 5min candles as soon as the market opens, then buy the first candle to go green. If they open strong, I may enter at half dollars or whole dollars, entry at 5.00 with stop at 4.90, or entry at 5.50 with stop at 5.40. Alternatively, I can wait for the first 1min or 5min bull flag to form. These pullbacks on the 5min chart are typically the safest entry points, but sometimes stocks are so strong they go parabolic (50-100% moves) before pulling back. There are some days when I won’t have a watch list because there isn’t anything I like. On those days I will instead be trading off my High of Day and Reversal Scanners. These scanners will show me stocks that fit my requirements in the middle of the day, even though they weren’t on watch from the pre-market session. Remember, always practice trading in a simulator before you trade these strategies with real money! Prove you have what it takes to be profitable. 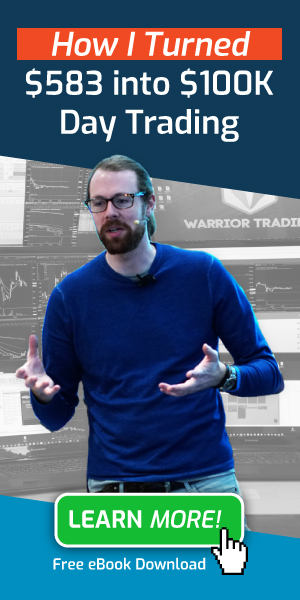 If you aren’t already a member we’d love to have you join us in our day trading classes or our chat room. Our Daily Gap Scanner will appear below. In our Day Trading Chat Room I will be posting each of the stocks I’m watching today! Don’t want to wait for our next free day? Join me here.